Yentel Caers on the podium in the single elimination! Taty Frans top 10. From the 10-13th of April the First PWA event of the year took place in Bonaire in the freestyle discipline. Home spot of our new Point-7 Black Team member Taty Frans, where he also run his own windsurfing centre with his brother Tonky. 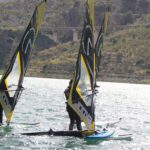 The wind delivered every day to run both single and double eliminations and the sails used by our team were the Freestyle Slash from 4.4 to 5.2. Yentel Caers after finishing third in the single, closed his event in an amazing 4th place confirming his last year great performance. Taty Frans did not manage to keep his 5th place of the single but closes in Top 10 with a final 9th place. 2 riders, both top 10, a great result for Point-7 Black Team first event. Taty Frans ‘ Level was super high. Everyone was sailing amazing and it was nice to compete at home. First event on Point-7 and back in top 10 in the freestyle ranking’.